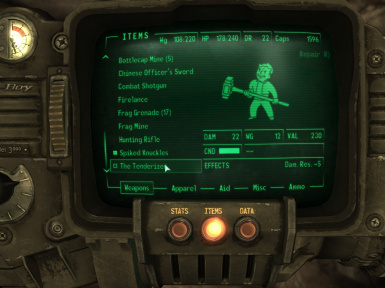 One of the many (many many) oversight-induced bugs in Fallout 3 is the Tenderizer. A harder-hitting variant of the Sledgehammer, it was also meant to have an effect which reduced the target's DT by 5 on hit. Unfortunately the effect was never associated with the weapon, removing its special ability. However, there's another problem with the Tenderizer effect that isn't immediately apparent: it never wears off except if the target dies. While this isn't a problem for hostile NPCs and monsters, this can be absolutely devastating if it is somehow applied to allies, Companions, or even the player. First and foremost, the Tenderizer's object effect is now associated with the weapon. It will apply a -5 DT effect to targets on hit. Secondly, the Tenderizer's effect now has a duration of 1 minute. This allows it to apply the -5 DT effect reliably and for a length which makes it combat relevant, but will allow it to wear off should the effect somehow be applied to an important or allied NPC, or even the player. As far as I know this is the only mod which addresses the duration issues with the Tenderizer's effect.